The Turkish authorities are investigating foster families for suspected ties to the failed July coup. An official says it may remove children from homes if their guardians are found to be coup supporters. 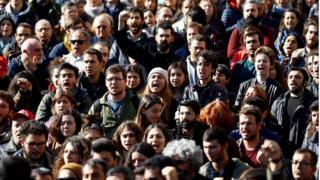 More than 125,000 people were dismissed or suspended and about 40,000 others arrested after the coup attempt. Last week, the European parliament voted for a temporary halt to EU membership talks with Turkey because of its "disproportionate" reaction. The government says its investigations are necessary to curb the influence of Fetullah Gulen, the US-based Muslim cleric accused by Ankara of orchestrating the coup. Mr Gulen, who lives in self-imposed exile in Pennsylvania, has condemned the coup and denies any involvement in it, but the government calls his network "Gulenist Terror Organisation" (Feto) and has vowed to continue the purges. Local media say around 5,000 foster families and some related institutions are being investigated. "It would not be right for a child to remain with a (foster) family if links to Feto are confirmed as a result of the examinations," an official from the Ministry of Family and Social Policy told the Reuters news agency. He said it would be a slow process in which the well-being of the children would be considered. "It is out of the question for children to be suddenly ripped away from their families," he said. Human rights groups say President Recep Tayyip Erdogan is using the coup as a pretext to curtail dissent. Allegations of mistreatment in custody are emerging, and the BBC has received evidence of abuses.